Like many Android phones, the majority of OPPO smartphones support dual SIM, allowing you to use two SIM cards in the same phone. This includes low-cost phones such as the OPPO R11s as well as higher-end devices like the R15 and R17 Pro. Dual SIM can be useful for separating business calls and personal calls, accessing different networks on the same phone and using your phone overseas. If you want to access the full benefits of 2 SIMcards in 1 phone, ask your local phone store about dual SIM OPPO smartphones. A SIM card (Subscriber Identification Module) is needed to connect a phone to a mobile network. Traditionally, phones had a single SIM card slot, but many Android phones now use a dual SIM configuration. This has space for two SIM cards as well as memory cards. Users may switch between these two SIM cards to make and receive calls, send SMS and use mobile data on their preferred network. On some phones, both SIMs may be active at the same time so you don't miss calls or texts on either SIM. What is the point of a dual SIM phone? What are the advantages of dual SIM? A dual SIM phone avoids the cost and hassle of carrying and charging two phones for different purposes, as you can do everything you want on the same device. Businesspeople can easily separate their business contacts and messages from their personal contacts. It can also be easier to reimburse work calls without having to go over your phone bills. People who travel overseas can keep their regular SIM active while using a second SIM card for local calls and mobile data, avoiding expensive roaming charges. You're not stuck with a single mobile provider if you get patchy coverage or want to enjoy the benefits of two mobile plans without the limitations. Two SIM cards also means twice the storage for contacts and other data. Can I have two phone numbers on one phone? Yes. Each SIM card you use has a different phone number, so you can keep your contacts separate. This means you can use the same phone for business use and personal use, and you won't have to worry about missing calls or texts if one number is busy. If you want to use one mobile plan for calls and another for mobile data, you can do both at the same time. You can also buy a local SIM card when travelling abroad and pay local rates rather than roaming charges, while still being able to use your Australian number if needed. Can dual SIM phones be on different networks? Yes. With a single SIM card, you're locked to one network and will have to remove and insert a different SIM card to use another. With a dual SIM smartphone, you can have two different networks on the same phone and switch between them with ease. If your mobile plan offers good deals for calls but is less good value for mobile data or has patchy coverage, you can add a second SIM on a different network to get the best of both worlds. In an emergency situation, a second network option can be a lifesaver. Can a dual SIM be used at the same time? 1. Dual active SIM – both SIMs are active and can be used to make calls, send and receive SMS and use mobile data. If you're taking a call or using data on one SIM, you'll be notified if someone is trying to contact you on the other SIM. You can choose to put your first call on hold to answer the second call rather than letting it go to voicemail. 2. Dual standby SIM – both SIMs are ready to use and can receive calls and SMS, but only one SIM can be used at a time. This means that if you're using one SIM and you receive a call or text on the other, you won't know about it until after you've finished, when the first SIM goes to standby again. 3. 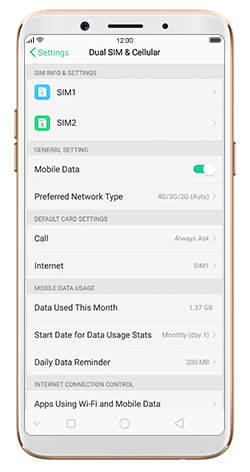 Dual SIM switch – two SIMs may be used, but you have to switch between SIM cards manually or your phone will only use the default SIM. This is usually only seen in cheaper phones and not smartphones. How do I insert a dual SIM? If you already know how to insert a SIM in OPPO smartphones, dual SIM is no different. The phone needs to be turned off before you remove or insert SIM cards, and you should check that both SIMs are already activated so they will be ready to use. 1. Find the card needle included in your phone package. 2. Locate the hole next to the SIM card tray. This is usually on the side of the phone, but it can also be on the back. 3. Insert the card needle. The SIM tray should pop open. 4. Remove the card tray from the phone. 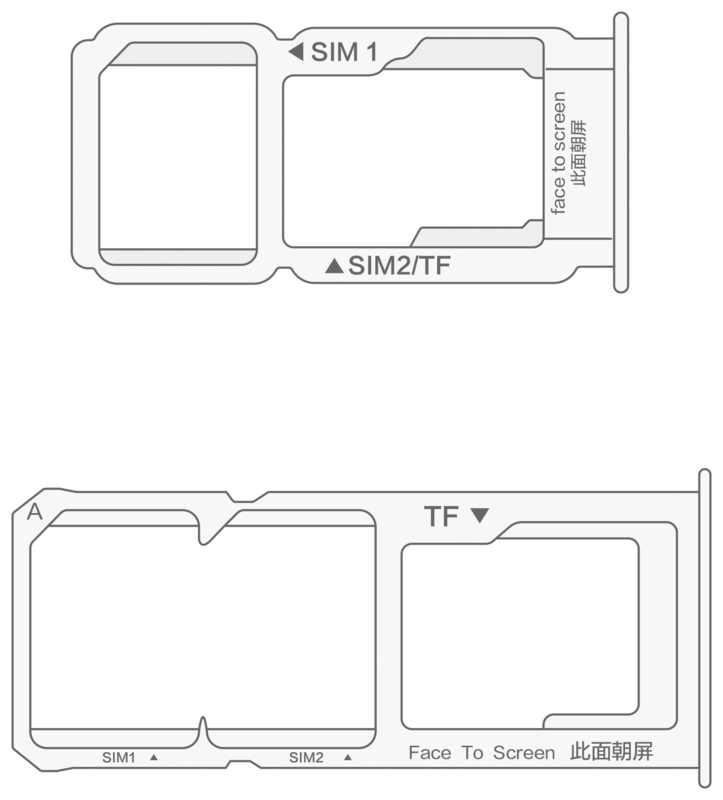 Place your main SIM card in the first slot (SIM1) and your second SIM in the second slot (SIM2). Make sure both SIMs are firmly inserted and correctly aligned, with the metallic sides facing down. 5. Replace the card tray in the phone. 6. Turn on the phone. If this is your first time using a SIM, the E-Warranty Card registration page will appear. Note: If a SIM card does not fit into the slot, talk to your mobile provider about getting a replacement. Cutting a SIM card down to size may cause damage. How do I set up dual SIM? Your dual SIMs will now be ready to use. Can you use a dual SIM phone with only one SIM card? Yes. If you don't have a second SIM, or you only want to use one, a dual SIM OPPO phone will function just fine with a single SIM card inserted. However, a second SIM can be useful for backup storage even if it's not connected to a network, and you never know when it could come in useful. Can I have 2 phones with the same number? No. Both SIM cards need to have unique numbers, but they may be used at the same time in a dual active configuration. This means you won't miss any incoming calls or texts on one phone number while the other number is in use. Do dual SIM phones consume more battery? Running two active SIM cards at the same time does use marginally more battery power than a single SIM, but this is only a minor drain. This is because both SIMs use their own radio transceiver. A dual standby configuration uses less battery power, as only one SIM is active at a time. Is dual SIM better than single SIM? The only disadvantage of dual SIM phones is that battery life is affected, but this is only a minor drain. Which OPPO phones have dual SIM? All new OPPO smartphones in Australia use a dual SIM configuration to give users more flexibility. Only some older smartphones are limited to a single SIM card. Compare smartphones online to find the perfect match for your lifestyle and your price range.